Does the proposed Sodo arena site have a light-rail advantage over KeyArena? The presence of Link Light Rail stations in Sodo often is cited as an advantage. But two companies proposing to renovate KeyArena say an upgraded Monorail would negate the Sodo advantage. With that in mind, we decided to run a timing test. Public transportation has been a prime talking point in the Seattle arena debate about whether a KeyArena remodel or new venue in the Sodo District is the best option. The presence of Link Light Rail stations in Sodo often is cited as an advantage, especially with expansion of that transit system not scheduled to arrive at KeyArena until 2035. But two companies proposing to renovate KeyArena — Oak View Group and Seattle Partners — say the venue has an existing light-rail connection that negates the Sodo advantage: the Monorail. Both envision enhanced Monorail service in their plans. To judge how effective that Monorail connection could be — and whether the Sodo site truly holds a light-rail advantage — we decided to run a timing test. We boarded a light-rail train at Westlake Station downtown and rode it to the Stadium Station between Safeco and CenturyLink Fields. Then, we got out and walked the remaining distance to where the entrance to Chris Hansen’s proposed Sodo arena would be. After that, we did a second test beginning at the Stadium Station, where we rode a light-rail train back to Westlake Station. From there, we rode an elevator up to the Monorail platform and took that train over to Seattle Center, got off and walked the remaining distance to KeyArena. Why use Westlake Station as a focal point for the two trips? Well, there really was no scientific way to do this. There are a bunch of possible combinations of starting points where anybody using light rail to go to KeyArena or Sodo could first get on. What we’re really trying to measure is the impact of the eventual transfer from light rail to the venue. In other words, if you’re already on light rail and an equal number of stops away from either site, how much longer would it take to reach the arena’s front door once all transfers and walking is factored in? If going to the Sodo arena site, the biggest added transfer time would come from walking to the arena after leaving the light-rail station. For a light-rail trip to KeyArena, the Monorail transfer would cause the biggest additional delay. So, which proved quicker? On this day, the KeyArena trip. But it was close. It took about 19 minutes, 30 seconds to take light rail from Sodo, connect to the Monorail and eventually arrive at KeyArena. We needed just over 21 minutes to take light rail from Westlake to Sodo and then walk the remaining distance to the envisioned arena site there. In the two cases, because we rode the light rail an equal number of stops in either direction, it took approximately eight minutes of time on the train. But what cost the most time on the trip to Sodo was the 13-minute walk to the arena that came afterward. Google Maps also estimates a 13-minute walk totaling 0.7 miles. There are a few walking routes, starting with the Sodo Trail — or, as we did, one of the main avenues running parallel — and then hanging a right on Holgate St. and walking to the arena land. We stopped timing it shortly after turning on to Occidental Ave. S., which runs right down the middle of the planned Sodo arena. For the KeyArena trip, we walked back to Stadium Station and then started our timer the minute the light-rail train left that station for Westlake. After a similar ride of about eight minutes, the biggest delay was waiting about four minutes for the elevator to travel up to the Monorail platform. Sure, we could have just hopped up several flights of stairs. But that’s not always an option for families or older sports fans. If the Monorail is to be an effective transfer, it would have to use a mechanized system to get people upstairs. We lucked out in that the Monorail train was pulling in just as we arrived upstairs. In just two minutes, we were departing — a very quick transfer, as trains that day ran 10 minutes apart. From there, it took just under two minutes to arrive at the Seattle Center Armory and then a three-minute walk through a food court and down some steps and across a plaza to the back of the arena. Seattle Partners plans entries on all four sides of the arena. Oak View Group also says one of its planned entries would be near that rear portion. This wasn’t necessarily about which trip was faster, just seeing whether either site holds any significant light-rail advantage. 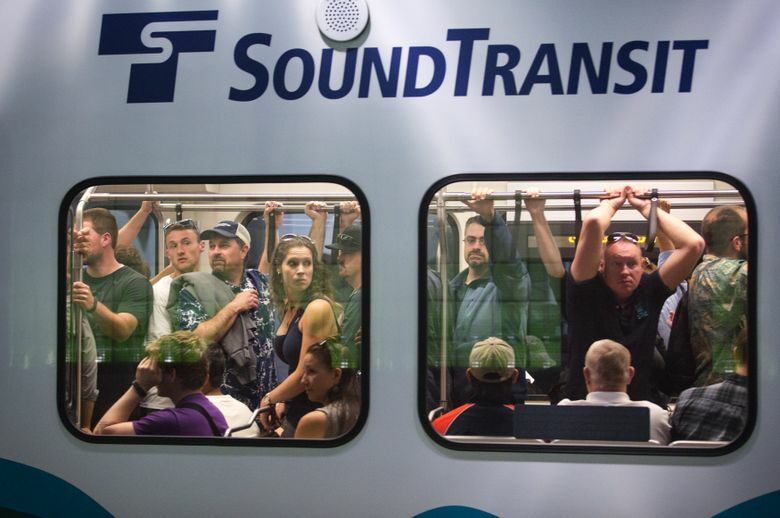 For now, neither appears to have an advantage despite Sodo having actual light-rail stations. Some may quibble with our having a Monorail train pull in just as we got off the Westlake Station elevator. But both renovation groups want expanded Monorail service before and after games so nobody is standing around more than a few minutes. Finally, there would almost certainly be some expanded station access so you don’t get caught waiting four minutes for an elevator like we did. So the early takeaway is that travel times were almost negligible. And that’s before any Monorail improvements. And KeyArena would hold the light-rail advantage once ST3 expansion leaves a station at its doorstep in 2035. And though that’s a long way off, what our experiment shows is that — for now, at least — if you take light rail to sporting events, the results show it likely wouldn’t matter much which of the two sites the city chooses.